Barbara moved to Walnut Hills in her early 20’s (1957). She and her husband have lived in Cincinnati ever since, raising 3 daughters. They have been active in Church of the Advent in Walnut Hills, as well as in other WH organizations. These audio files are from an interview with Barbara conducted on July 17, 2017. When Barbara first moved to Cincinnati, she worked at a sales office for Dow Chemical, located on Victory Parkway near McMillan. Barbara also lived in that area at first. Here Barbara describes how she found a place in the new city. Notice the role of the church in providing community. The church she mentions is the CELC Building, which now houses Echo Church worship on Sundays. Barbara has been a long-time member of Church of The Advent. During that time, the church has gone thru significant changes in both membership and focus. Barbara describes the church as it was when she and her husband joined in the late 1950’s. Church of the Advent has a long history of outreach to the Walnut Hills community. 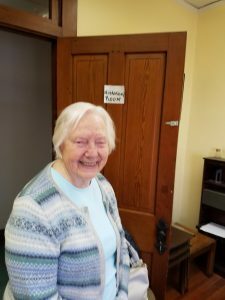 Barbara describes some of the activities at the church during the 1950’s and ‘60’s, especially to the “Mountain People” – immigrants from Appalachia who had a large presence in Walnut Hills at that time.